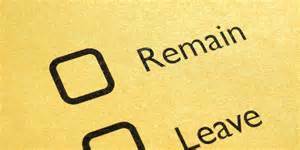 The IL position reached at our AGM is to urge members to vote to stay in the EU. This is not because we have any illusions in the EU. It is not democratic (then neither are the House of Lords or the monarchy). Yes it is a bosses club; but then so is the UK. We are against fortress Europe; we don’t see voting for what will be fortress UK is a better thing. We are in favour of the free movement of workers; we don’t see voting for what will be a restriction on that movement into this country as a better thing either. Yes, a leave vote will badly fracture the Tory party and may mean the end of David Cameron – to be replaced by Boris Johnson! A remain vote will also badly fracture the Tory party. Yes, Greece has been treated shamefully by the EU – but don’t forget that the IMF has been involved as well. In Greece the IMF applied the tactics they have employed in Africa, the Far East and South America: austerity and privatisations; the difference this time is that the barbarity was closer to home; closer for us to see. Germany as the major debtor has treated Greece vilely; but that is a reflection of German politics. Indeed the whole of what is described as the rising tide of neo-liberalism in the EU is nothing but a reflection of the defeat of the left in Europe and in particular the collapse of social democracy. Rail privatisation, mass out-sourcing of work in this country wasn’t and isn’t the fault of the EU; it was caused by home grown politics. Austerity in this country is not mandated or directed by the EU. It arises out of domestic politics. Our position to remain was driven by two things. Firstly; a negative – that the ‘out’ campaign would be dominated by xenophobia, nationalism and in some cases racism. This in turn would embolden the right and in particular the fascism right. The notion that the ‘Lexit’ campaign would compete or counter this was fanciful. Now our fears have been amply confirmed. The right and the far right are growing from this campaign. But we had a positive reason as well. Through the EU hundreds of millions of workers have been grouped together; this allows the possibility, not seized so far, to build a unified, all-European working class movement. Why would we swap that possibility, that wonderful opportunity only to retreat into a nation state? It is a truism of our movement that a worker in the UK has more in common with a worker in Germany or France etc. than with any boss in the UK, be they so-called British through and through. Why would we seek to loosen that bond of commonality by voting for the UK fortress state? No to xenophobia, to nationalism, to racism; vote remain, vote to remain and fight; vote to remain and build that unified, all-European working class movement. VOTE REMAIN. When was the IL AGM? The IL AGM was on 5th Decemebr 2015.